Papers: 1977-1994, 26 cubic feet. The papers of Timothy Joseph Penny contain correspondence, speeches, voting records, legislative files, and miscellany, mainly from his congressional service. Subjects covered in the files include the federal budget, agriculture, elections policy, constituent relations, and the closing of the University of Minnesota at Waseca. Access to the collection requires permission. An inventory for the papers is available in the repository and online. A video interview is in the Minnesota Historical Society audio-visual collections. Videocassettes: 1984-1988, 5 commercials on 2 videocassettes. 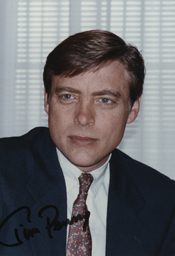 The commercials were used during Timothy Joseph Pennys campaigns for the 1984 and 1988 U.S. congressional elections in District 1 of Minnesota, Democratic Party.